A Golf Ball Hits My Car, Who Pays? You’ve just spent a sunny afternoon on the golf course with your friends. You’re walking towards your car reminiscing about your birdie putt on eleven, when you see it: your windshield. It’s completely unsalvageable with cracks spanning the entire width of the glass, and the guilty golf ball still lingering at the scene of the crime. Your head swivels around searching for someone to blame, but your eyes keep coming back to that golf ball staring up at you from the pavement. In situations like this, you’re unlikely to find the person who hit the golf ball; more often than not, golfers have moved on and don’t even realize that they hit something that caused damage. What do you do? Who pays for a brand new windshield? If you have purchased physical damage coverage for your car, the cost to replace your broken windshield is likely covered by your Personal Auto policy. Physical damage coverage is broken down into two parts: “Collision” and “Other than Collision”. 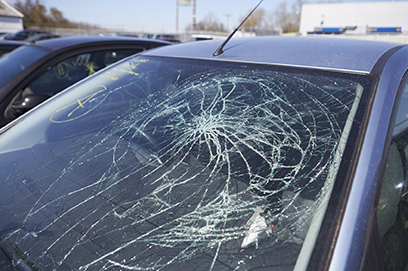 Damage to a windshield that is not due to a collision is covered under “Other than Collision”. (Other incidents that would be considered “Other than Collision” include theft and vandalism, fire, floodwaters, and storm damage.) Although a deductible applies to most physical damage claims, many policies reduce or eliminate deductibles for windshield damage. Check your policy or contact your Independent Insurance Agent for specific information on your coverage, and the next time you’re pulling into your favorite golf course, try to park far away. Accidents can always happen!